All dinner reservations are to be made by phone only. 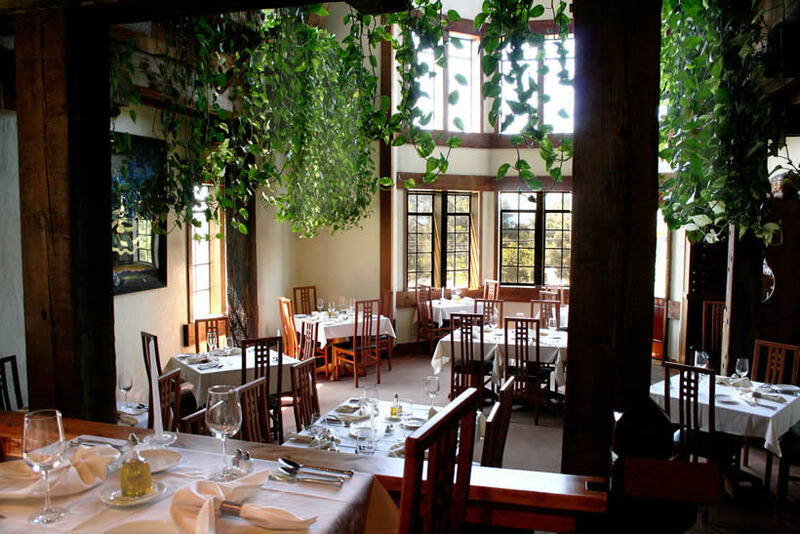 Celebrate any occasion, large or small, in our dramatic three story Main Dining Room featuring our original, highly acclaimed and award winning North Coast Cuisine...freshly prepared organic and wild foraged food...fresh seafood, wild mushrooms and wild game. For lighter fare, relax in the cozy atmosphere of The Seaside Bar where you can enjoy your favorite cocktails and a seasonally-changing menu of delicious small plates. A full breakfast is delivered to your cottage or cabin each morning. Full service catering is also available. When people ask me what North Coast Cuisine is, I tell them it’s a style of cooking that uses ingredients native to the area, food created from elements that occur (or should occur) naturally in the landscape and the sea outside my windows. That makes it a cuisine in which foraging, real and as a metaphor, plays a vital part. Some elements that play a large role in our menus still thrive locally, like wild boar, sea urchins, mushrooms, greens, blackberries, fennel, truffles, ling cod, and crab. Some, like abalone, should still exist locally but have been destroyed by greed. I do, however, keep farmed abalone as a menu option because I think it reminds us of what we’ve lost and how carefully we should be harvesting from nature as so many of our natural treasures keep disappearing. Finally, my consuming passion is that what you can’t forage, you should buy locally. Small farmers and growers live and die by our decisions in the market. That’s what your time in the kitchen should be about. That’s what your time at the table should be about. And I hope that’s what your life is all about! Come up and see us if you can! We feature a wonderful selection of North Coast Red and White wines as well as a small selection of Napa Valley, French and other California wines and French Champagnes. And if your tastes run more to the maltier beverage, you’ll be delighted to discover our Mendocino County and other Northern California craft beers and ales.